Steve Gob poses with a 17-year old John Davis on the sidewalks of Cleveland, Ohio, circa 1938. Gob and Davis lifted in the same class but their first attempts at Olympic gold were dashed when the 1940 Helsinki, Finland games were cancelled. Davis went on to win many weightlifting titles and Gob went on to be a professional wrestler in Canada. Non-Functional? Please… When performed correctly, the bench press certainly can be an excellent upper body strength builder. John Davis certainly wasn’t any worse for the wear for bench pressing in his routine, and he was one of the finest Olympic weightlifters and all-around strength athletes in history. The bar looks to be loaded to around 400 pounds and Davis seems to be handling it pretty easily. Note the fact that there are no uprights. This shot was taken at Yarick’s Gym in Oakland, California. Yakov Kutsenko was a great Ukranian heavyweight who competed for the Soviet Union and won two European titles (1947 in Helsinki and 1950 in Paris) and two Silver medals at the world championships (1946 and 1950, both in Paris, both times losing to John Davis.) Kutsenko set three official world records, all in the clean and jerk and all in 1947. Can any Lifter REALLY Gain Strength and Muscle at any age? GRAY HAIR AND BLACK IRON, the first and only book of its kind, shows you how! 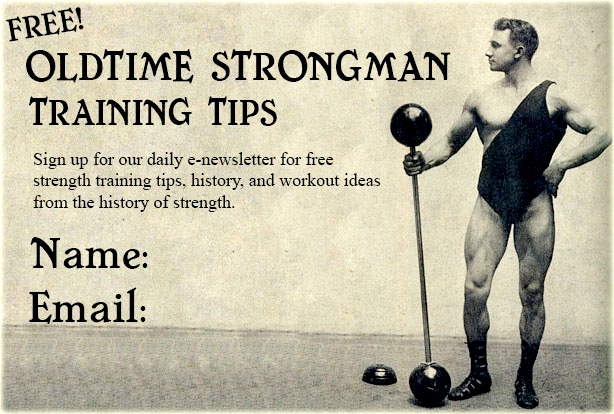 Let’s face it… most of the training info these days is written by (and for) muscle heads. There is little ‘there’ for anyone who is serious about getting results and this is especially true for older lifters who have been around the block a few times and are tired of the latest “fads”. Without many places to turn for the right kind of training info, many older lifters have thrown their hands up in frustration… but now a completely new kind of training guide has come along to turn the tide in a completely different direction. 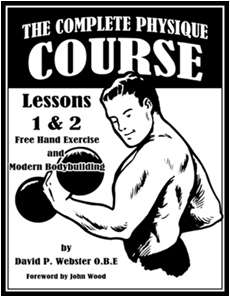 A Book for Older Lifters… and Not a Moment Too Soon! Brooks Kubik famously wrote the modern classic Dinosaur Training back in 1996 which was and is the book that thousands upon thousands of trainees list as their strength bible. While the methods and techniques of Dinosaur Training have certainly stood the test of time, Brooks found that, as the years went on, some of the things that he once talked about needed to be adjusted a bit. Of course, Brooks wasn’t the only one interested and in this type of information, the entire generation of Dino trainees wanted (and needed) to hear it as well. Brooks looked high and low and when he didn’t find what he was looking for he realized that he was going to have to be the one to write it The result was a classic for a whole new generation: Gray Hair and Black Iron,which was written specifically with older lifters in mind. As you can see, the topics that are covered throughout Gray Hair and Black Iron are extensive. Brooks left no stone unturned. We listed the tips and techniques that we found of great interests but there are undoubtedly other gems that you’ll find as you flip through its pages — and this is the type of book that you will flip through very often. Whether you need a quick workout incorporating just a few barbells and dumbbells, or a more detailed routine to add some poundage to your top bench press, you’ll find more than FIFTY different workouts which run the gamut. Simply pick the one you need and get to work. 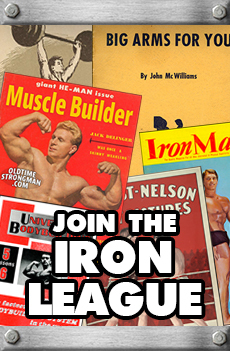 We’ve listed many pages worth of reasons why Gray Hair and Black Iron should be in every older lifter’s strength library but the fact of the matter is that the advice contained within it is for lifters of any age. The name of the game here is usable, practical, time-tested training info built on common sense and most importantly of all, results. 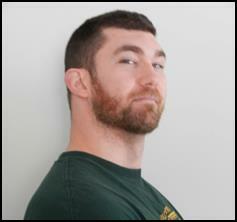 The workouts can be performed “as is” or adjusted as needed, either way, this is just the type of information that every lifter should here. Too often, lifters spend the second half of their training careers trying to make up for the mistakes they made up in the first half… Gray Hair and Black Iron is the type of book specifically written to help anyone avoide those mistakes in the first place. Besides, if you don’t need the book right now, the fact of the matter is that you will at some point. If you have read this far, we know you are serious. In case you can’t wait to get your hands on your personal copy of Gray Hair and Black Iron you should know that we always have several cases on-hand and ready to ship asap. Orders are generally shipped the same day they are placed or the next available opportunity – the faster we get your books in the mail, the sooner you can start using them to get stronger. Gray Hair and Black Iron is 310 pages in length and contains the 25 chapters covered in detail above. The book is a 8-1/2-inch by 5-1/2 inch trade paperback with a heavyweight glossy cover. There are no illustrations. All that’s left to do now if for you to take action. You can order your copy online or give us a call any time during normal business hours. Grab your copy today! This was the first team to lift against the Russians. Davis and Stanczyk both won Gold, Terpak and Kay took Silver and Spellman took Bronze. The Russians entered ten lifters to only six from the US but the US came back with the team championship. If you are truly interested in size and strength, you need to train your legs. — and one of the best leg exercises is the barbell squat. In fact, heavy squats have built the foundation of some of the greatest strength athletes in history. Here’s a look at the great John Davis squatting at Ed Yarick’s Gym in Oakland, California in the 50’s — and that’s how you should be squatting: full and deep. No monkey business there, just pure power development. I’m not a fan of squatting with a board under the heels but it seems to work for John Davis, who was Twice Olympic Weightlifting Champion (1948 and 1952) and Six Time Senior World Weightlifting Champion (1938, 1946, 1947, 1949, 1950, 1951).